The Reverend Jordan Winston Early (1814 – after 1894) was an American Methodist african american preacher, considered to have been one of the pioneers of African Methodism in the West and South of the United States. In 1868, he married Sarah Jane Woodson Early, and the couple were prominent in spreading Methodism and black nationalism, and his wife taught wherever he preached. Early, a former slave, was born in 1814 in Franklin County, Virginia. After his mother's death, when Early was three, he and his siblings were cared for by a maternal aunt, an uncle who taught him astronomy, and an older woman on the plantation, known as "Aunt Milly". Sold separately from his parents, he became a minister at the age of 12. Early and his family were taken by their masters to Missouri in 1826, where Early joined the Methodist Church, and was emancipated in the same year. While working on a riverboat that plied between St. Louis and New Orleans, he learned how to read and write, taught by a Presbyterian minister and a shipmate. Joining the African Methodist Episcopal Church in 1832, Early worked to build more local congregations. In 1836, he was licensed as an AME preacher. He helped expand the church in St. Louis, New Orleans, Illinois, Indiana, and Tennessee. By 1838, he was ordained a deacon. In 1840, Early and other supporters built the first AME Church in St. Louis. In 1843, he married Louisa Carter, and they had eight children, four of whom survived to adulthood. The Earlys sent their children to Wilberforce University. He became licensed as an exhorter in 1853. In the late 1850s, Early evangelized in Tennessee and founded AME missions in Missouri (Kirkwood, Saint Charles, Roche Port, Washington, Jefferson City, Louisiana, Booneville, Saint Joseph, and Weston). After Louisa died in 1862, he married Sarah Jane Woodson Early on September 24, 1868. The couple were prominent in spreading Methodism and black nationalism; his wife taught wherever he preached, serving as a principal in four cities. Jordan Early and his wife Sarah retired to Nashville from active minister appointments in 1888. His wife wrote a biography of her husband and his rise from slavery that is included among postwar slave narratives. ↑ "Sarah J. W. Early (Sarah Jane Woodson) Life and Labors of Rev. 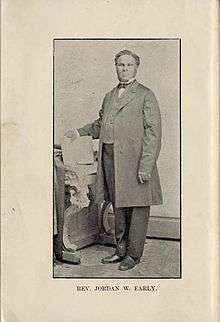 Jordan W. Early, One of the pioneers of African Methodism in the West and South.". Nashville: Publishing House A.M.E. Church Sunday School Union. 1894. 1 2 3 4 Smith, Jessie Carney (1996). Notable Black American Women. VNR AG. p. 199. ISBN 978-0-8103-9177-2. Retrieved 28 August 2012. 1 2 Belt-Beyan, Phyllis M. (2004). The Emergence Of African American Literacy Traditions: Family And Community Efforts In The Nineteenth Century. Greenwood Publishing Group. pp. 85–. ISBN 978-0-89789-799-0. Retrieved 29 August 2012. 1 2 Katz, William Loren (1 May 1999). Black Pioneers: An Untold Story. Taylor & Francis US. pp. 47–. ISBN 978-0-689-81410-5. Retrieved 29 August 2012. ↑ Tsenes-Hills, Temple (31 August 2006). I Am the Utterance of My Name: Black Victorian Feminist Discourse and Intellectual Enterprise at the Columbian Exposition, 1893. iUniverse. pp. 131–. ISBN 978-0-595-40687-6. Retrieved 29 August 2012. 1 2 3 Smith, Charles Spencer; Payne, Daniel Alexander (1922). A History of the African Methodist Episcopal Church: Being a Volume Supplemental to A History of the African Methodist Episcopal Church, by Daniel Alexander Payne ... Chronicling the Principal Events in the Advance of the African Methodist Episcopal Church from 1856 to 1922 (Public domain ed.). Johnson Reprint Corporation. pp. 34–. Retrieved 29 August 2012.